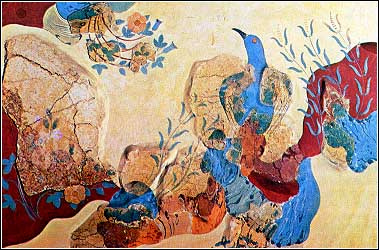 Minoan art is characterized by an exquisite naturalness combined with a disconcerting formalism. The absence of perspective in painting gives a flat effect, yet the human figures, beasts, and plants are rendered in accurate detail. Plants or rocks tend to be treated as elements of a formal pattern. But animals are often shown in astonishingly natural poses, nowhere more effectively than in the frescoes from Thera, where swallows are charmingly depicted in flight, and a pair of antelopes convey the grace and supple movement of the species. All the important buildings of the later Middle Minoan and earlier Late Minoan periods seem to have been decorated with elaborate wall paintings. They are usually called frescoes, though not strictly executed by the fresco technique. They were painted on plaster, but at most sites this has decayed and broken, so that the reconstruction of a picture is difficult and often conjectural. New discoveries in Thera, of the highest artistic quality, have greatly increased the modern knowledge of and admiration for Minoan art. The subjects of the paintings are varied. There are life-sized human figures—some in elaborate costume, others scantily clad for sport. A convention dictated that men are shown deeply bronzed, while women, even when engaged in athletics, are painted pure white. Other scenes, such as spectators at games, are much smaller in scale. Landscape is represented, but often in a formal way, with highly colored rocks representing mountains or with palm trees and a wavy blue band making a river scene. Numerous animals are shown, including many, such as monkeys, that cannot have been native to Crete. The small-scale sculpture shows the same mixture of realism and formality. The figures are lifelike but stiff, and even an acrobat leaping over a bull fails to convey the sense of movement. Some of the highest artistic achievements are engraved sealstones, often depicting a complicated scene with great economy of line. Minoan architecture lacks a sense of grandeur and organization. Even such a large complex as the palace of Knossos is more an agglomeration of units than a carefully planned whole.Its size is nevertheless impressive, approximately 150 by 100 meters (500 by 325 feet). 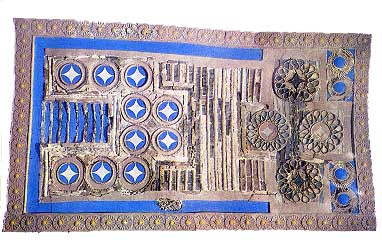 The characteristic feature of all Minoan palaces, which distinguished them from the mainland type, is the way they are built around a large rectangular central courtyard, which at Knossos measures 60 by 29 meters (197 by 95 feet). Thus they are inward-looking, though windows on upper stories will have afforded views of the surrounding countryside. Shallow sunken basins in the interior of the buildings may have been no more than light wells. But certain features of their construction are puzzling, and many scholars regard them as serving for ceremonial ablutions. Water was supplied to the palace by underground channels, and the toilet arrangements were superior to anything known in the West before the 19th century A.D. The walls were constructed of courses of masonry bonded and tied together by vertical and horizontal wooden beams. It is thought that the purpose of the design was to provide resilience against earthquake shock. Seismic damage is in fact detectable in the history of most sites. The wooden members, however, had the major disadvantage of exposing the building to a high risk of fire. The freestanding wooden columns had a characteristic shape: their capitals were larger than their bases, so that the columns tapered downward. There is no agreed explanation for this custom. Little is known about town plans, since at most sites no more than a limited area has been cleared. The small town of Gournia is an exception, and here clusters of irregular houses are separated by narrow lanes. The area excavated at Thera shows complexes of upper-class houses with narrow, winding streets and minute squares. The most remarkable feature of Minoan sites is the absence of town walls or any other defensive fortifications. It would appear that the Minoans lived so peacefully that they could trust for defense to their sea power.